Beginning August 2017, customers can now order an Electronic Benefits Transfer (EBT) card on the Self-Service Portal (SSP). If your EBT card is lost, stolen, or your address has changed, please log into your MyACCESS at http://www.myflorida.com/accessflorida. Your EBT card will no longer have an expiration date. 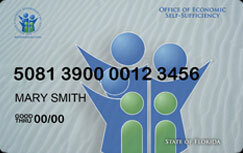 If there is an expiration date on your card, the card will expire on the last day of the month/year that is shown. If there is no expiration date on the front of your EBT card, your EBT Card will only need replacement if lost, stolen, or damaged. Florida started issuing non-expiring cards September 1, 2017. 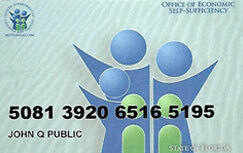 Florida EBT cards cannot be used to purchase alcoholic beverages. EBT cards cannot be used at ATM or Point of Sale (POS) machines in bars, liquor stores, adult entertainment establishments, pari-mutual gambling facilities, slot machine facilities, casinos or commercial bingo and gambling facilities.